“The Open Mind,” the longest-running program in US Public Broadcasting history, turns 60 this year and got a new lease on life when Alexander Heffner, grandson of the original host, Richard Heffner, took over. Heffner is currently a Fitzwater Fellow at the Franklin Pierce University in Rindge and will remain through the NH primary to explore the intersection of the political process and the millennials (now the largest voting demographic). At 26, he’s one of the youngest hosts on national television and, he notes, is “working to discover a new generation of thinkers as well as to engage known leaders.” His recent guests include Alberto Ibarguen, Salman Rushdie, Maya Soetoro-Ng, Ben Rattray, Austin Beutner, J.B. Smoove and Jill Soloway. His approach of non-adversarial conversation was the trademark of his grandfather, the historian and broadcaster who created “The Open Mind” while working as a professor of communications and public policy at Rutgers. It’s an approach that the younger Heffner has taken to heart. When you were growing up, did you ever imagine you would one day take over your grandfather’s role on “The Open Mind”? When he passed, there was a hole in my heart. “The Open Mind” certainly inspired broadcast pursuits but not until then did I imagine myself, with the support of our family, the kindred spirit succeeding him on the airwaves. The description of the show as “a quiet and thoughtful excursion into the world of ideas” sounds like an anachronism in this age of warring ideologies. Is it? It’s true that civility is not in vogue. But we can’t let it become obsolete. Otherwise, we’ll not only lose our distinction as a free society but the function of a civilization (which without civility has met its demise). 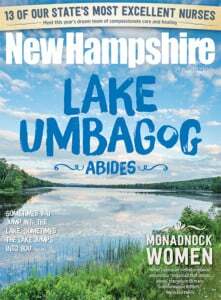 How has your impression of New Hampshire changed since you’ve been “embedded” here? I may have underestimated the accuracy of Walter White’s backwoods hideout in the season-ending “Breaking Bad” portrayal. The vast wilderness — in all its glory — was a new day for this born-and-bred New Yorker. Is there some NH landmark you intend to visit (or revisit) before you leave? Josiah Bartlett’s house — inspiration from a real-life Colonial and fantastic presidential hero. Could you sum up the difference in political points of view between baby boomers and millennials? To distil in brief would be nearly impossible. What’s your honest opinion of the “First in the Nation” role played by New Hampshire in the presidential primary? The people are certainly decent and among the best prepared to perform their patriotic duty. More diversity here can ensure the continued credibility of New Hampshire’s special status. A complete archive of the original episodes of “The Open Mind” as well as Alexander Heffner’s reboot are available at video.pbs.org/program/open-mind.